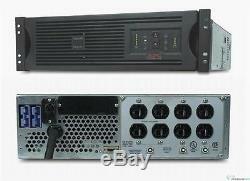 APC SU3000RMXL3U SMART-UPS 3000VA XL 3U 120V 2400W POWER BACKUP New Batteries. APC SU3000RMXL3U SMART-UPS XL 3U 3000VA 2400W 120V RM BLACK. P/N: SU3000RMXL3U , INPUT/OUTPUT 120V, INTERFACE: DB-9 RS-232 & SMARTSLOT. 2400 Watts / 3000 VA.
Less than 5% at full load. Output Frequency (sync to mains). 47 - 53 Hz for 50 Hz nominal, 57 - 63 Hz for 60 Hz nominal. 50/60 Hz +/- 3 Hz (auto sensing). Input voltage range for main operations. Input voltage adjustable range for mains operation. Maintenance-free sealed Lead-Acid battery with suspended electrolyte : leakproof. Typical Backup Time at Half Load. 27.9 minutes (475 Watts). Typical Backup Time at Full Load. 7.8 minutes (950 Watts).